Bermuda College has announced that the first two volumes of its Bermuda College Journal, Voices in Education, has been uploaded on EBSCOhost, an online research site offering a broad range of full text and bibliographic databases. Volume II of the Journal was officially launched to a small gathering on September 22 in the College Library. 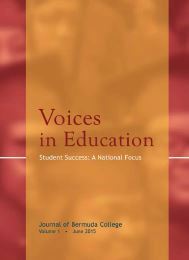 Under the theme, “Transforming Education for the 21st Century: New Thinking, New Action”, the Journal contains seven articles with a foreword by co-editors Dr. Phyllis Curtis-Tweed and Ms. Lynette Woods, and an editorial on the theme authored by Dr. Victoria Marsick, Professor of Adult Learning and Leadership at Columbia University Teachers’ College. Co-chairs of the BC Journal Committee, Lynette Woods and Ru-Zelda Severin, said, “Meaningful contributions to Voices in Education from Bermudians and professionals who contribute to the Bermudian community, are deeply appreciated. We are overwhelmingly excited about the potential of Voices in Education as the Committee plans for diverse topics, scholarly events, and meaningful milestones related to Student Success as a national focus. Ms. Woods noted there is a process where the articles will be loaded on to an assigned database before they become generally accessible for research. Other contributing authors to the latest volume include Davidson Bishop; Dr. Phyllis Curtis-Tweed; Shawn DeShields; Dr. Tracey Lynne Harney; Karmeta Hendrickson; Francoise Palau-Wolffe; Cordell Riley; Dr. Llewellyn Simmons; Dr. Sharon Speir; and Lynette Woods. A copy of the journal can be viewed or downloaded here.